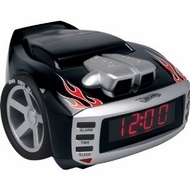 Emerson makes it easy for young boys to wake-up for school with the Hot Wheels Snore Slammer alarm clock radio. Boys will love incorporating the fun of Hot Wheels into their routine of going to bed and waking in the morning. The alarm can be set to play Snore Slammer custom sounds or to favorite radio station. Alarm has snooze button for extra tired boys who don't want to wake up for the first alarm. Boys will love adjusting the volume and tuning the radio with the car wheel controls. 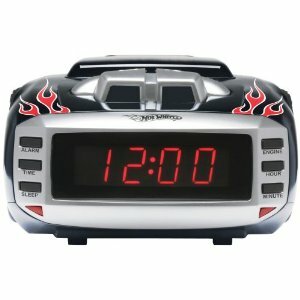 Alarm clock radio has car reflector nightlight with an on/off switch. All features are controlled with easy to use buttons. The clock radio has a bright easy to read 7-inch LED display and built-in AM/FM antenna. No need to reset clock after a power outage with battery back-up which holds one "9V" battery.